To date, 2011 has been an exciting year in North American capital markets. The owner of the Toronto Stock Exchange was put into play. At the same time, south of the border, the owner of the New York Stock Exchange agreed to merge with Germany’s Deutsche Boerse. While the future of the TMX Group hangs in the balance, the Canadian market remains open for business in 2011. Over $1 billion in initial public offerings have been completed in 2011, with more in the pipeline for the second half of the year. In the United States, IPO activity has significantly increased in 2011 compared with the same period in 2010, with over US$8 billion raised to the end of June compared with US$2.7 billion in the first half of 2010. Debt markets have been active in 2011, with over $40 billion in senior and subordinated bonds issued in Canada and US$655 billion in the United States. Notably, as we indicated in last year’s report, there is an active high-yield market in Canada, with over a dozen deals being done since mid-2010, and more in the pipeline. As the year unfolds, we will watch the impact of Basel III on financial institutions and capital markets generally. We expect to see financial institutions involved in limited capital-raising activities in the near term. Torys’ lawyers have been actively involved in these developments. In the pages of the report linked below, we share with you what we have seen in 2011 and expect the rest of the year to bring. 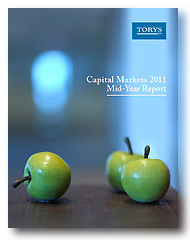 To download a copy of Torys' Capital Markets 2011 Mid-Year Report in PDF format, click here. Cover photo: Green Apples, 1993 (detail), by Victor Cicansky/Mira Godard Gallery.